A cat dressed in a three piece suit with an expensive hat walks down the street with Margaret Thatcher, David Cameron and some other Tory Party politicians (use the closest to a Tory politician you can think of). A bird flies through the forest, and as it lands it takes the form of a man (if you know a man named Manu, imagine it taking his form). Two pigs walk up to a sleeping woman. “Is she awake?” one asks. “I don’t know – poke her.” The first one then pokes the sleeping woman with a trotter. A rat runs through a restaurant with an apple core in its mouth. A chicken struts along the ground pecking at peas. [Literally means “small rat”] A mouse is busy eating an apple core. The mouse is the core eater. Eeyore the donkey from Winnie the Pooh series walks through a paddock, only instead of a donkey he is a horse. 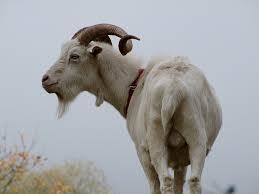 Four billy goats sing in a barber’s shop. They are the Billy Goat Quartet. A deer emerges from the forest wearing a scintillating tiara. A cow in a skirt hits a golfball off a tea. She is the famous bovine golfer Lydia Kau. A woman is wearing massive hooped earrings, when a car drives past, throwing up a chunk of tar onto her. On her ears are tar rings. A car opens up its headlights and instead of lights there are eyes there. A man in a canoe paddles down a river, but the canoe gets stuck on the giant stone face of a moai in the current. 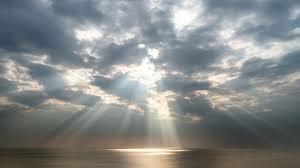 A man is praying on his knees when a ray of light bursts through the clouds and strikes his forehead. A man with incredible hair sits on a chair, as part of a contest. A woman walks up to him with a pen and clipboard and asks if she can mark his hair. “Mark away,” he replies. At K-Mart, two disembodied heads get into an argument. The heads are exhibiting mart anger. An artist sits at a desk, practising how to draw mouths in the Japanese manga style. A solider dressed in khaki has a neck that stretches high into the air. Sailing through the ocean, impossibly managing to stay afloat, is a boat made of wicker. A woman rides a bicycle past a line of noisy picketers. 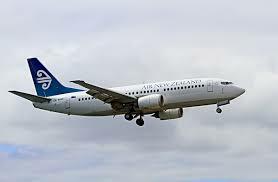 An aeroplane crashes into a gigantic pile of horse manure. A knight rides a motorcycle as if it was a jousting horse, only instead of a lance he has a pike. He is the motor piker. A man drives his car at different speeds along a road. Then he comes to a woman holding a bunch of ice-creams. “Try one,” she says. A king and his retinue walk into a cannabis cafe. They get so high that they float off the ground, departing from the Earth entirely. They have departed because they are the high retinue. A ferry full of very poor looking people arrives at a wharf. It is the poor ferry. The passengers disembark under a large “Welcome” sign. A lion leaves its pride and climbs halfway up a mountain. Then it turns back and, to say goodbye, lets out a roar from up there. It is a higher roar. A man is showing a slideshow of travel photos from all around the world. In them, the man appears to be very hairy. A backpacker climbs up through a bizarrely constructed building, and it looks adventurous. As they pass a dangerous-looking chunk of porcelain, the guide in front of him says “Mind the toilet”. A roaring gust of wind pulls up into the shape of a wild mustang. A mist floats through a section, and when it reaches the owner’s carport underneath their house it condenses into a cloud. Thousands of rays of light burst out of the face of the Sun, and each of the rays has a foot at the end of it. The sunshine is very feety. In the night-time sky, a star unwraps a block of feta cheese and starts eating it. An explorer stops by a river to get a drink of water, when an arrow lands in the water beside him. 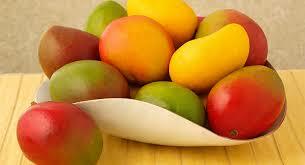 From the precipice of a craggy mountain, an avalanche of mangos roll down the cliff face. In the night-time sky, shining down in the place of the Moon is the face of Marama Davidson (if you don’t know who she is, imagine the Moon’s face is smeared with marmite). Seen from an inside window, a storm sets in, so bad that it blows a man’s toupee off his head. A skyful of clouds emits a peal of thunder and then, out of the clouds, comes a squadron of fighter planes. A Land Rover drives across a wide range of different landscapes, then hits a rock and damages its fender. It starts raining. Instead of raindrops, weiner sausages fall from the sky. 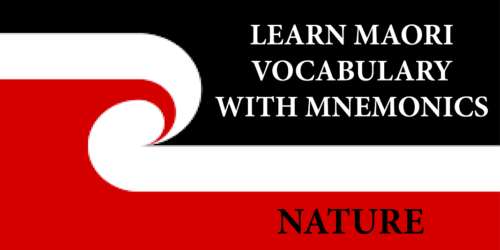 The above is an excerpt from the upcoming ‘Learn Maori Vocabulary With Mnemonics‘, by Jeff Ngatai, due to be published by VJM Publishing in the summer of 2017/18.